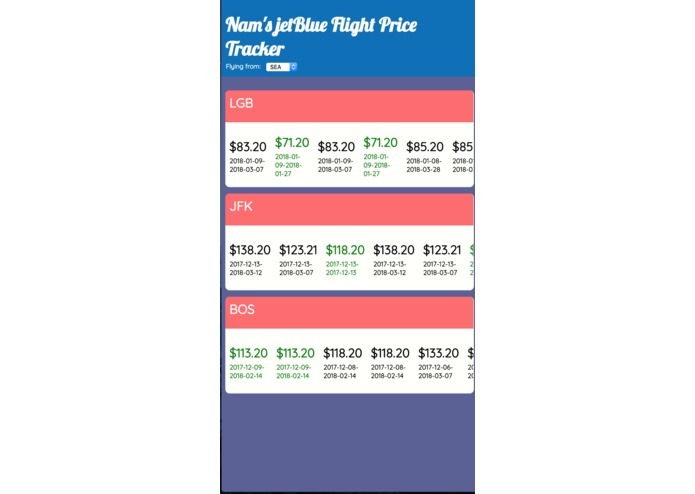 Nam's jetBlue Flight Price Tracker is the perfect website for users who want to regularly checkup on deals on flights in one easy and simple page. Other sites are often too hectic and messy, pushing users and potential customers away. It is usually by word of mouth or stroke of luck in social media content that users will be exposed to good flight deals. We wanted to facilitate information on to one easy and slick page where potential customers can see the lowest prices to various destinations at a glance. 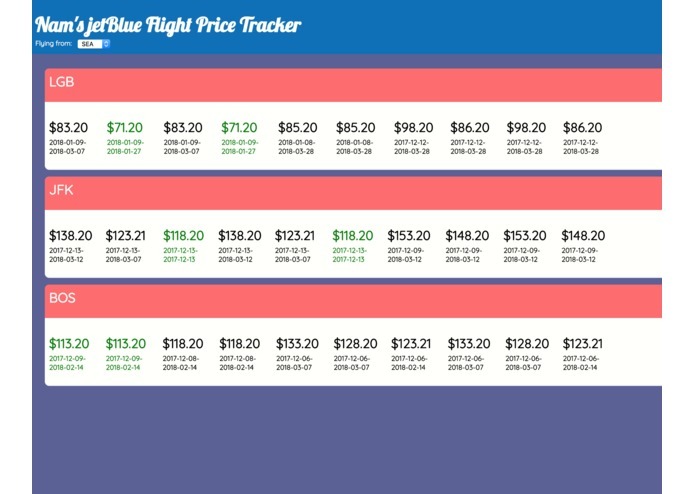 Nam's jetBlue Flight Price Tracker is a niche website that displays flight ticket prices for various airport destinations from various airport origins as offered by jetBlue. The goal of the site is to keep users up to date with potential deals on cheap flight tickets and lead users straight to jetBlue's checkout page. Cards are shown for a given destination airport with a list of budget prices for a given date range. The prices in green indicate the cheapest flight tickets. Users can also scroll horizontally to view more prices (if there are). The web application was built using Node.js with the Express Framework. It utilizes the given data set to generate prices from origin to destination as offered by jetBlue. All pages are dynamically created with Hogan.js, alongside a dynamic URL, allowing users to search for flight deals from almost any jetBlue-supported origin flight. The page itself is fully responsive for both desktop, tablet and phone users. The biggest challenges was dealing with the given data set. Designing the structure of the map to organize all our data was the key to succeeding in this project. The clean slick look of it and the clean slick backend map behind it. We even implemented when the International Space Station would be over a certain destination! An organized and thoughtful architecture is what makes or breaks an application. Future iterations of the web application would include adding email subscriptions/notifications to deals, getting the most up to date flight information straight from the jetBlue API and including relevant hotel/lodging prices and deals to the desired destination.